Home BAGS health news health tips useful info worldhealthinfo DON NOT THROW THESE BAGS AGAIN! WHEN YOU SEE WHAT CAN THEY DO, YOU`LL KEEP THEM LIKE A GOLD! DON NOT THROW THESE BAGS AGAIN! WHEN YOU SEE WHAT CAN THEY DO, YOU`LL KEEP THEM LIKE A GOLD! Normally, shoe boxes come with bags filled with silicon dioxide or silica. 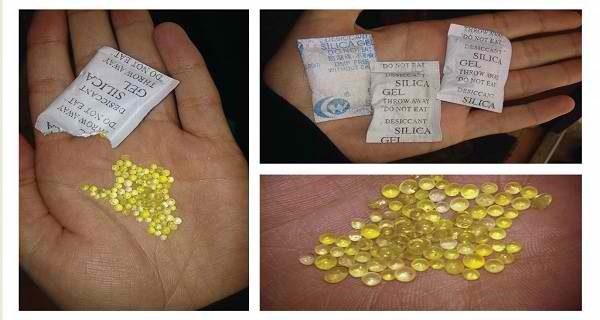 The majority of people find these silica bags useless, some even annoying. However, these bags are much more useful than you might think. Actually, you should keep them, because if you throw them you will make a mistake. They are not useless nor toxic, but very practical and beneficial, instead. Go on reading to see how you can utilize these white or yellow granules around the house. If you put these little bags in your wardrobe you will prevent occurrence and spread of moisture. Furthermore, you can prevent the unpleasant smell that goes hand in hand with moisture. Place a few of these bags in your makeup case and you will keep your makeup longer by preventing the moisture in your powder makeup. It might sound surprising or incredible, but silicon dioxide is able to restore your water-damaged phone. In case you face a situation like this, just put the phone among four to five silica gel bags, and they will absorb the moisture and dry the phone. Considering the fact that silica absorbs moisture, you should keep several silica bags into your training bag along with your workout gear, so that you prevent bacteria proliferation. They will also help you get rid of the bad odor and keep your bag dry and clean.